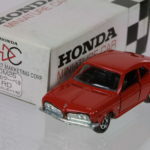 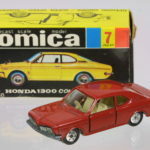 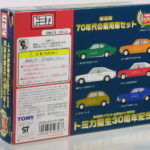 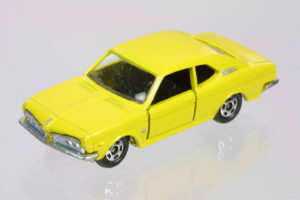 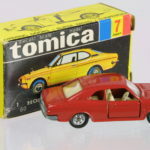 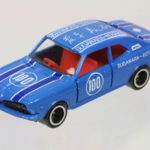 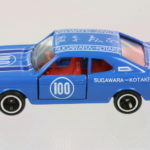 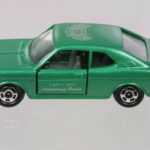 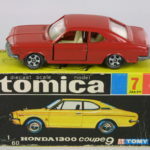 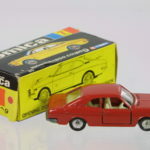 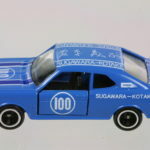 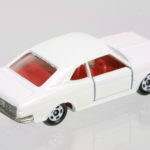 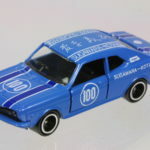 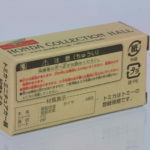 Tomica #7 is the Honda Coupe 9 (1300) . 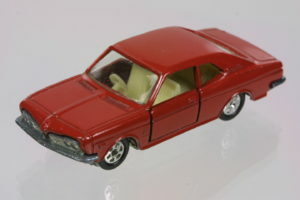 “COUPE9” license plate on the front only. 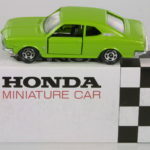 “HONDA” and “9” badges casted onto trunk lid and while the front fenders have “H” and “9”. 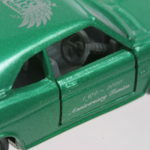 A “H” is cast into the nose of the car. 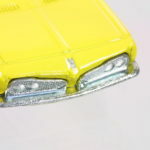 The C pillars have a casted ventilation grille. 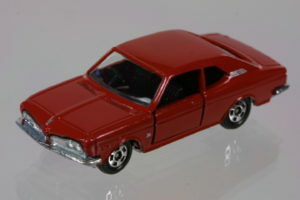 RHD model with chromed metal bottom which also forms the front and rear bumpers and fascias. 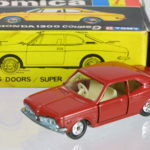 Doors operate. 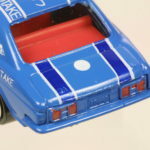 Dual outlet exhaust. 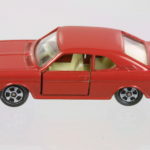 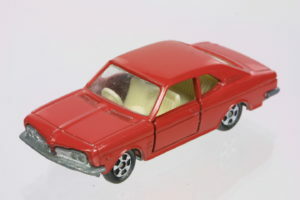 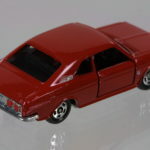 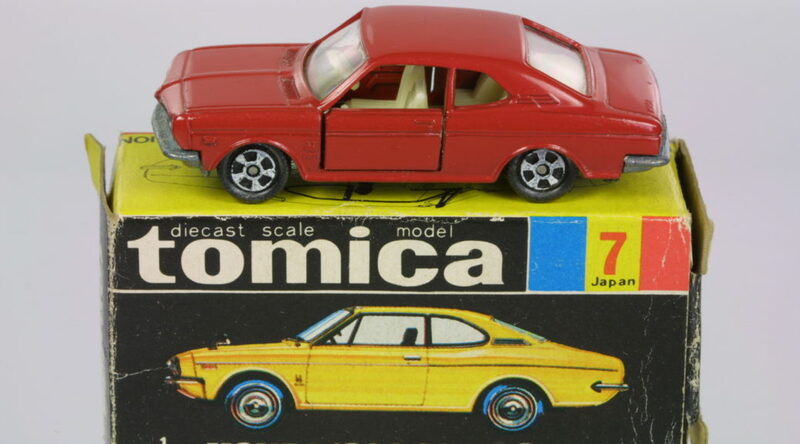 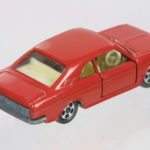 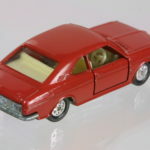 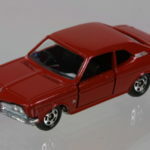 This is the grandfather of the Honda Coupe 9 in the Tomica line – a rare 1300 Coupe in red with 1A wheels. 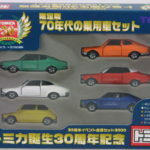 In mint shape like this one and in the proper box, they go for upwards of $200. 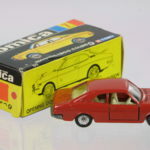 Note the red dot on the end of the box denoting the color of the model. 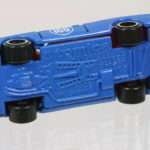 This one comes with the 1D wheel. 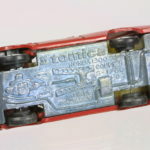 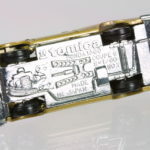 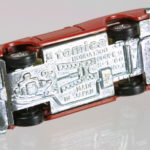 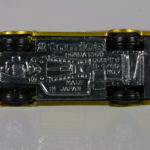 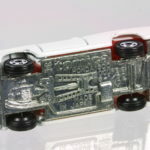 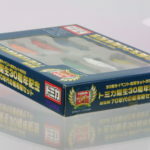 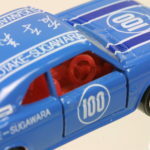 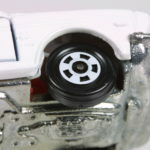 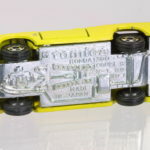 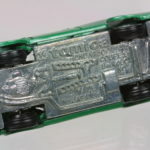 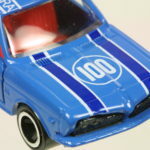 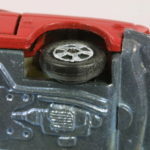 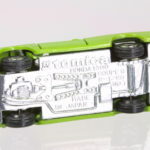 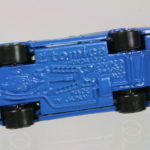 Please refer to the ZSource site for more information on Tomica wheels. 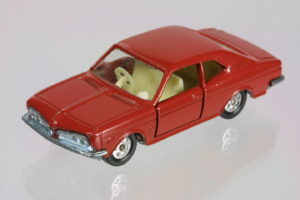 Here’s a variation of the the same early 1300 Coupe. 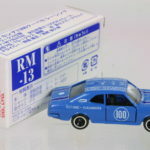 This one is similar to the previous one except for the fact that it has 1E wheels. 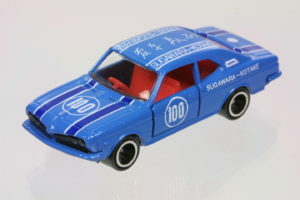 This model was obtained from ZSource. 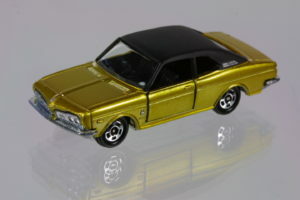 This model is gold with a matte black roof. 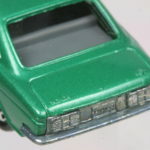 The C pillar ventilation grille is painted silver. 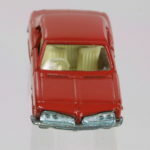 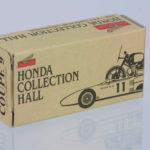 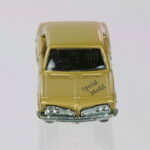 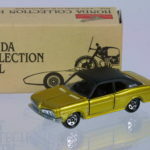 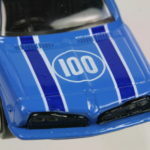 This variation comes in a Honda Collection Hall brown box with box ends identifying the Coupe 9. 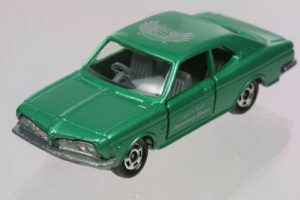 This model is metallic apple green. 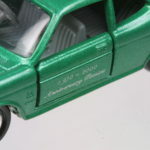 The C pillar ventilation grille, “H” badge on nose, and “H” badge on front fenders are painted silver. 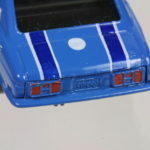 The chromed metal bottom have painted tail lights (except for the reverse light section. 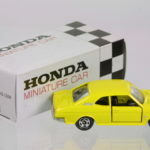 This variation comes in a Honda Miniature Car off white with checker design box (DM25 GR). 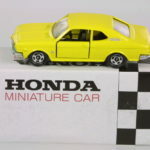 Here is a yellow version from Honda. 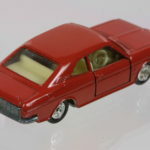 This model is red. 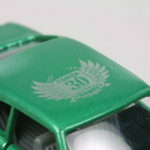 The C pillar ventilation grille, “H” badge on nose, and “H” badge on front fenders are painted silver. 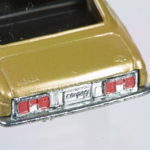 The chromed metal bottom have painted tail lights (except for the reverse light section). 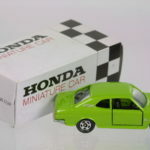 This variation comes in a Honda Miniature Car off white with checker design box (DM25 RD). 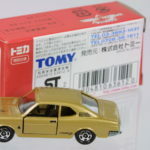 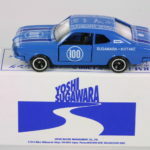 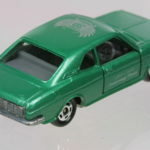 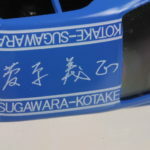 Here is one of the newer versions that were part of a Tomica Special Edition. 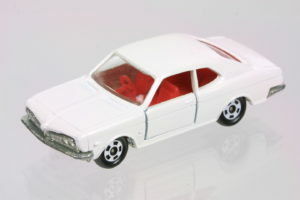 This is a gift set reissue of the early 1300 Coupe in white with white hubs (to mimick the 1A wheels). 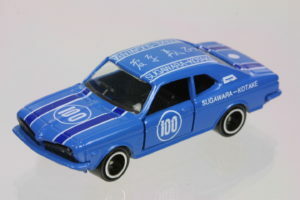 A newer custom issue race version with the wider chrome lipped race wheels and a black interior.